There are various types of vehicles for saving money, and each has its own set of risks and rewards. Most of the retail investors are clueless about the difference between stock, bonds and mutual funds, and think that all of them are same. However, these investment instruments vary from each other. 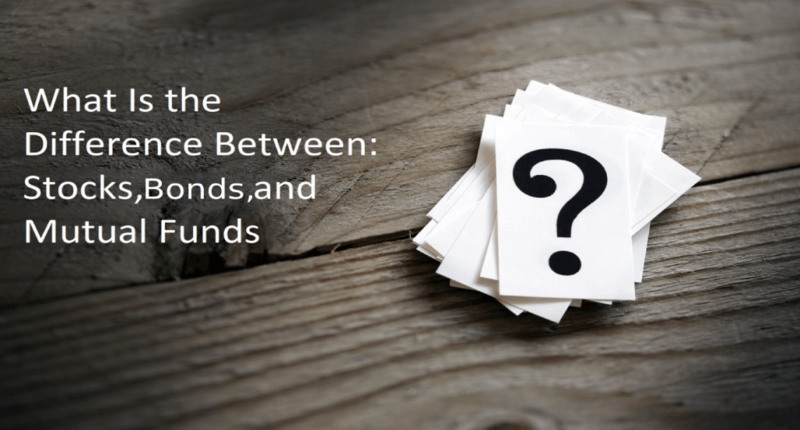 Knowing the difference between these popular investments can help the beginners to determine what products fit a personal diversified portfolio. Stocks: Stock means ownership in a company. When someone buys stock of any company, she/he owns a piece of the company, and the value of their shares rises and falls as the company’s perceived market value fluctuates. Corporations sell stocks (ownership in the company) to raise the capital for expansion, marketing, improvements, modernization etc. rather than borrowing the large amount from banks, NFBCs etc. There are many types of stocks – large cap stock, mid cap stock, small cap stock, emerging stocks, international stocks etc. Stocks are the certificates of equity and are riskier than other types of investments, but tend to reap better returns. Remember that risk and return are directly proportional. Investment in good companies can have better potential to staggering returns in the long term. Therefore, when investing, you should consider your ability to handle extra risks or volatility to reap the potential rewards. It is very important to remember that when the stock price goes down, you don’t lose anything unless you sell the stock at a lower price than what you paid for it. As long as you hold on to stocks, you can sell the stock when the stock prices bounce back. There is no guarantee of return on stock. That means it is a risky investment, you may end up losing original invested amount. So be careful while choosing stocks. Bonds: To put it in a nutshell, a bond is a loan. When you purchase a bond or invest in it, you lend your money to an entity (government or a company) which issues bonds for a defined period of time at interest rate. Like loans, bonds come with a variable or fixed interest rate which can involve periodic payment during the life of the bond or a single payment at end of maturity. Bonds are issued by companies, municipalities, and state and fed government to raise money and finance various projects, maintain ongoing operation or refinance existing debts. Bonds are known as conservative investments as one who purchases bonds, can choose the length and term of the bond and know how much return she/he will get at maturity. There are many types of bonds i.e. government bonds, corporate bonds, short-term bonds, intermediate-term bonds, long-term bonds and inflation-protected bonds. Bonds can be secured and unsecured. In secured bond, specific assets would be given to the bondholders if issuer could not repay the obligation. Unsecured bonds, on the other hand, are not secured by a specific asset. The investors have issuer’s guarantee to repay but have no claim on any collateral. Unsecured bonds are called debentures. Bonds are less risky than stocks. You will lose money only if the issuers default on their obligations. This is very unlikely to happen especially with government bonds. However, bonds’ earning can be quite low as compared to other long-term investments like stocks. Mutual Funds: A mutual fund is a professionally-managed pool of money accumulated from several investors to purchase various financial assets such as stocks, bonds, bank deposits and other securities. Each investor has own shares i.e. a portion of holdings of the fund. Rewards, gains and losses are shared by all investors in equal proportion, according to their contribution towards the corpus. Mutual funds are administrated by financial experts or professional fund managers to yield good returns. In a mutual fund, the value of shares goes up and down according to the rise and fall in the value of stocks and bonds in the fund. While in stocks people are investing in one company, in mutual fund money is invested in dozens of companies at the same time. This built-in diversification can provide a certain security which stocks don’t. The process of combining investment with assets, known as diversification, to reduce risk is one of the key advantages of investing in mutual funds. There are hundreds of mutual funds based on goals and risks. Before investing in any fund, you should identify your financial goals. Decide what is important for you – long-term capital gains or current income? Each fund has different approach and goal. Identifying a goal is an important step in choosing from the plethora of mutual funds available to investors. Moreover, investment in securities often comes with certain risks; risk and return are directly proportional. Mutual funds are ideal for diversifying your investments and you can start investing from as low as Rs. 500 through SIP. Thus, anyone can benefit from a professionally managed investment account. A good retirement plan and child’s education are heavily invested in mutual funds. Mutual funds are classified as Equity fund, Hybrid funds and Debt funds and each has its own benefits and limitations.